For kids to understand the Bible, they need to understand its entire story from beginning to end. Following up The Church History ABCs and Reformation ABCs, this one-of-a-kind book for ages 2-7 follows the timeline of the Bible from A to Z-beginning with Adam, the tower of Babel, and the covenant, and ending with Zion, the new creation city. Each letter also includes corresponding Scripture passages, descriptions, and classical fine art accompanied by whimsical illustrations that correspond with each letter. 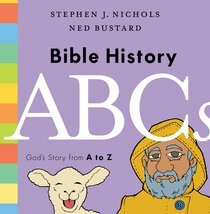 About "Bible History ABCS: God's Story From a to Z"